Ahh y'all! This is one of my favorite posts so far! If you follow me on snapchat, then you've probably noticed that every Wednesday me and Ryan split a bottle of wine and have a fancy dinner together. And now that I have an Insta for the blog, you'll probably be seeing even more of this lol. The reason for all of this is that I subscribe to Winc! 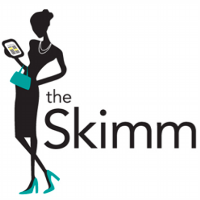 I'm obsessed with TheSkimm and read it every day religiously. 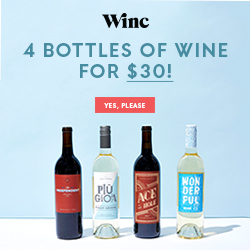 One day they were offering a special for readers on your first Winc order (see why you should be getting these emails!) so I was like hmmm. In case you didn't know, I'm a big wine drinker and tbh a lot of times the only way I can make myself finish a reading is that I'll bribe myself with a glass when I'm done. But I was a sorority girl so usually the only wine I drink is Barefoot Mascato. I get a little self-conscious when I go out to restaurants and they have wines that I've never heard of and I'm too scared to order the wrong wine and waste like $10 on a glass of something I don't like. I decided to at least check it out because really anything with wine in it kinda gets my attention. What I liked the most about their site is that the very first thing you do is take a quiz. As a picky eater (so I guess drinker too) I have very strong feelings about what I do and don't like. Having this taste-test quiz made me a little more confident that I wasn't paying just to give away a bottle of wine that I didn't like. The next thing that I was a fan of is that it lets you choose your ratio of red to white wines. I prefer white wines so I chose 4 white and 0 red. What's nice is that as I get a little more adventurous, I can go back and slowly switch it up 1 or 2 bottles of red a month. When I saw that I would be getting 4 bottles each month for $30 (after my first discounted month), I was pretty much sold. It helped that shipping is free too! I want to adventure out and learn about more wines and this is about how much I spent anyways so I was like sure why not. They have the option for you to "pause" your month's order which really helped me because if I'm ever broke (or maybe when I'm gone for next semester) I can pause it when I need it. What I love is that you can either have them send you just 4 recommended bottles based on your quiz results, or you can even go in and browse their selection and choose any wines that you for sure want that month and they'll surprise you with the rest. And then after you try your wines, you rate each one so their recommendations will just keep getting better and better. I can't tell y'all how excited I was to get that shipping notification! The day before I'd been grocery shopping and almost threw in a bottle of my go-to wine and then remembered nope I'm expanding my wines from now on so I had been patiently waiting. I did get a text warning me that someone over 21 will have to sign for the package. Normally this wouldn't be a problem because I'm 24, but my apartment accepts my packages for me so I was originally worried that only under-21 people would be working that day and couldn't sign and I'd be at work and obviously couldn't sign. I didn't want my wines to get sent back so I just went onto the FedEx app and re-routed my package to wait at my closest FedEx location so I could just come in and sign it. It comes in this cute little box with a handle on it so you can easily carry it. I was super excited to open the box and honestly I was pretty tempted to open all four bottles at once and make a little flight. It even came with this cute little book called Winc Journal that showcased all of their wines and gave you some information about each wine. So here's what I got for July! Another great thing that it has is a food pairing for each wine. Winc is actually great about this and about a week before I got my wine, they sent me an email with wine pairings just for my wines. This is one of my favorite parts about Winc because you're not just getting wines, you're getting a full fancy night. Me and Ryan already had a plan to try a new recipe each week and this completely took care of everything. I love, love, love that these are recipes that I've never had before and I feel so adventurous trying new things (this is a BIG deal for a picky eater). Another super great bonus is that all of the food we've made so far is fresh and healthy! 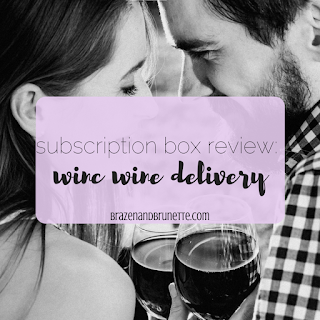 Really, it feels like I'm getting a food subscription box for free with Winc. Ok so in the food-pairings email that I got, for some reason this wine wasn't on the list. I'm sure it was just a snaffoo, but it didn't bother me at all (I later realized that the recipe was also in the Winc Journal so here's what it was). I got the wines before Ryan moved in and wanted to wait on him to cook the dinners, so I figured this was the perfect one for me to start with. I jumped feet first with this wine going from the super sweet moscato to the drier (adultier) chardonnay. Not going to lie, I felt like an über suburban mom with my chard. I didn't have a coffee table yet when I drank this wine, so I just sat on my floor sipping it while reading a case for my summer class and then afterwards decided to take it in for a bubble bath. Honestly, a bubble bath and wine go so perfectly together that this wine really took me to my happy place. 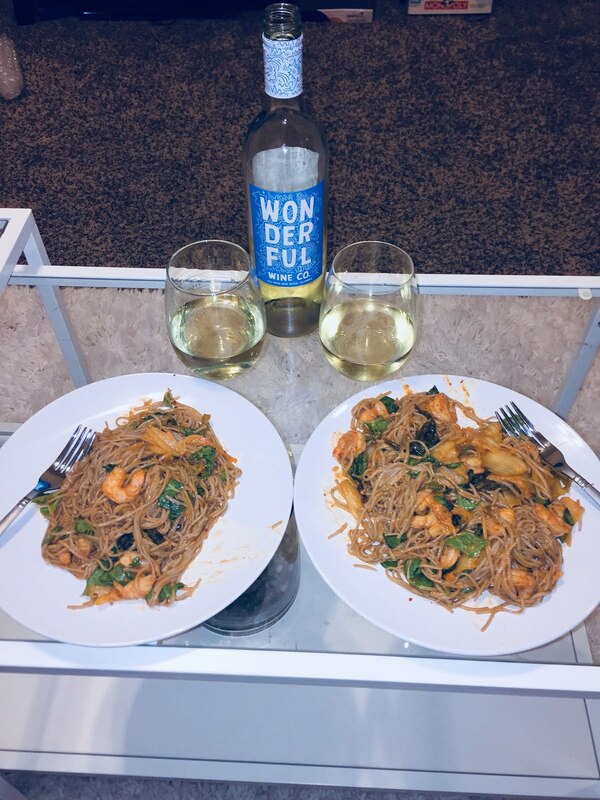 By this week, Ryan had moved in so I let him go through the food pairings for the remaining three wines and he chose this one because it went with pasta and he loves pasta so pasta it was! This was an Asian pasta and growing up in the Texas panhandle, I'm not used to Asian food that goes beyond fried rice. Speaking of which, this recipe took us to 3 different stores to find all of the ingredients, so I definitely recommend that you don't wait until last minute to go grocery shopping for this. But the recipe was surprisingly easy to make! I thought it was a little spicy (I'm a wimp when it comes to spiciness) so the wine actually really helped cool down my mouth. The recipe made so much that even after we finished our plates, we still had enough leftovers for another full meal. We ended up having it a few nights later and I just heated up some sesame seed oil in a pan and stir-fried it to reheat it and then added a little more soy sauce so it'd taste fresh. And it was just as good the second time! But by this time we didn't have any wine left. We each only had a glass of the wine during supper (the food was that good) and then afterwards enjoyed the rest while relaxing and watching TV. It really was the perfect stay-in date night! You can get the recipe here. This was Ryan's favorite meal that we've had so far! Since Ryan picked the last meal, I got to pick this one. Honestly he wasn't too thrilled about it and kept complaining about the girly drink and how little the salad looked. Yep I chose the salad because it looked so fresh and I'm trying to eat healthy so this sounded exactly what I wanted. We ended up using lima beans instead of fava beans and some manchego cheese that I already had in my fridge. Another alteration that I made was that I just cut up the asparagus vertically like you do with hotdogs again and again because I didn't have a mandolin, and I thought it worked out just fine. While we were making this salad, Ryan saw that it was essentially 3 vegetables all sliced up and said, "Yeah I'm pretty sure I'm going to end up making myself some mac and cheese to fill me up." But he didn't! It's soo strange because honestly you make it and you're like lolololol this is not a meal but it was surprisingly filling! And the wine went perfectly with it, too! Honestly the whole meal was so summery and cute that I was really tempted to just pack everything in a picnic basket and speed to the nearest park! 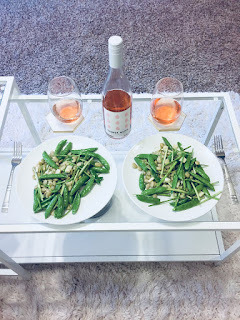 But I didn't make Ryan wait any longer because he'd already been super patient about waiting while I had a little photo shoot with our supper (I think this was the moment he regretted moving in with a blogger lol). You can get the recipe here. It was my favorite meal this month! I saved the best for last because I already knew that I would like the riesling (it's what I get when they're out of moscato) and I wanted to make myself try new things before I got to this bottle. The recipe for this one was kinda perfect to be the last one of the month because it was one part Asian, one part salad, so I thought it was like a cute little summary of everything we'd had so far! This recipe was pretty easy to make because we actually had almost all of the ingredients already (the ingredients from the Asian pasta helped). This made it one of my favorite meals this month, budget-wise because it was really cheap for such a nice meal. The Asian salad really got me excited because for the first time in my life I tried radishes and learned that I like them! The sauce that goes on this stuff is amazing and this was definitely another win. As for the wine, I knew I'd love it so I was pretty wine happy during supper. It was a beautiful summer evening that night so after I had my mini photo shoot we ate at the little table on my patio. And after we ate it was just perfect to sit out there and relax, chat, and sip. 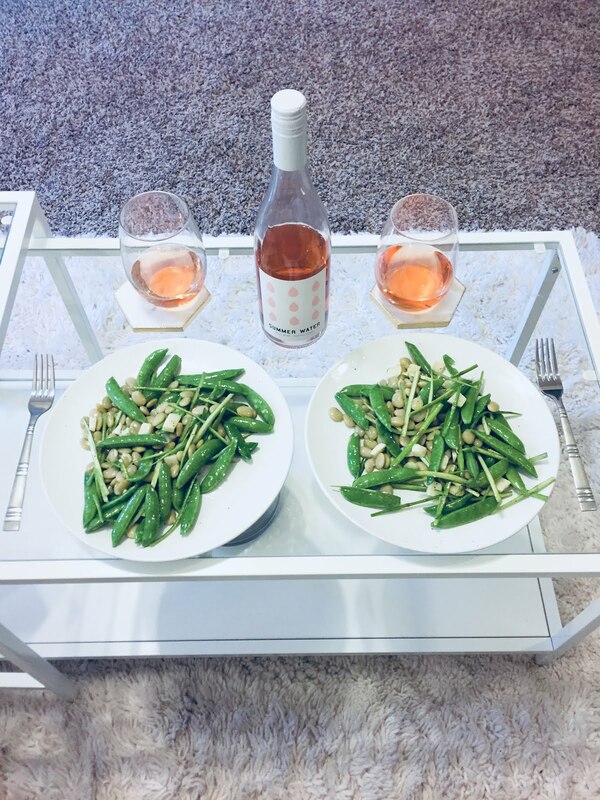 Seriously, if you're in a relationship, Winc nights are the perfect date nights! Also, check out the mint plant that we bought for one of our recipes! It makes the apartment smell so great and is super handy to have for cooking or making mojitos! You can get the recipe here, but really I think you need the wine to get the full experience! As you can tell, I'm now a Winc addict. 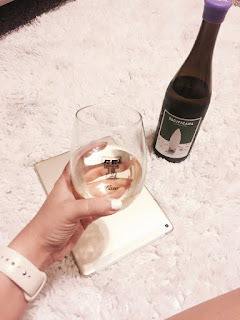 It sounded expensive until I realized that I was already spending about that much on wine anyways, but with Winc you don't just get bottles of wine, you get the whole experience! I love that I'm trying foods I've never heard of and learning about all different kinds of wines that I probably wouldn't have ventured out to try if I was at a restaurant. The built-in date nights are also a big plus! They also have the Winc app that's perfect because you can go in there and see what wines you're getting or choose your own, see when the next shipment date is, track your shipment, and review the wines that you've tried. An extra bonus is that for every 10 wines you rate, you get $10 off your next order! Even if you're not really into making all these meals, Winc is still a great investment. I drink a lot of wine because let's be honest, law school can get stressful at times. So it's nice to get a "you deserve this" box every month! And if you sign up using my link, you can get your first box for $22, which is cheaper than their normal first box special (see box below). If any of y'all out there end up subscribing to Winc, first of all you're welcome, and secondly comment below and let me know what your favorite wines are! This first box I just let them send me 4 recommendations, but I'm not opposed to going in and choosing some reader-recommended wines. Cheers! I love this blog post! Winc sounds perfect for those of us in law school who don't know how to pick out new wines. Does it only cost $30 every month? I was checking out their site but it looked like you only get it for $30 on your first order. Seriously it's the perfect thing to help you learn how to adult haha! Ok so I looked more into it and I think you're right and I've updated my post to be more accurate. They have bottles starting at $13 so you could get 2 bottles + $9 shipping for $35 a month or once you get 3+ bottles you get shipping free so that'd be $39. Mine has been a little more than the $30 every month so far because I always end up getting 4 bottles and usually I'll try to get at least 3 $13 wines but will allow myself to splurge on one more expensive wine (usually like a $15 bottle). The good part about getting 4 at a time is that I get my 10 ratings in faster to get my $10 off the next order. So it only takes me 2.5 months to get that discount, but by ordering 3 it'd take a little over 3 months to get it. One thing that has helped with the price is that now I go out less to bars on the weekend so I'm no longer spending like $30 on a night out. Okay cool! Thanks so much for the updated info!